The New York Giants got no measure of relief following their Sunday night defeat at the hands of Philadelphia. Perhaps looking past the 0-4 Browns to a tough week 6 matchup at San Francisco, the Giants needed all 4 quarters to put Cleveland away. Despite a strong defensive showing early, forcing two fumbles and sacking Cleveland QB Brandon Weeden 4 times in the first quarter alone, the Giants needed a Greg Little touchdown drop to maintain their 10-3 lead going into halftime. Cleveland's offense, much maligned in the past two weeks, showed signs of life against New York. Not counting multiple tackle-for-losses, Cleveland RB Trent Richardson flirted with 100 all-purpose yards. 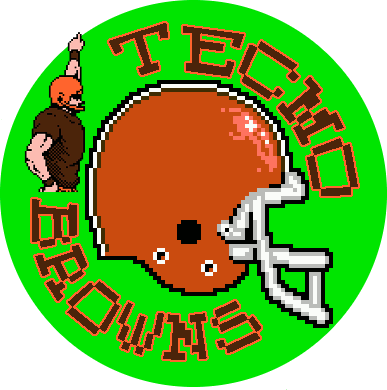 Weeden's tendency toward clutch interceptions, though, doomed the Browns. An early 4th quarter interception negated Cleveland's eight play, 75 yard drive, diminishing any chance of victory. Though still plagued by an acute case of the drops, Cleveland's WRs played well in the clutch. A late Greg Little TD catch brought Cleveland within a touchdown. The attempted onside kick, though, ended up in the hands of New York's Victor Cruz, keeping the Browns winless. TSB 2013 Predicted: T.Richardson; 7 carries for 59 yards. What Happened: T.Richardson; 17 carries for 81 yards. 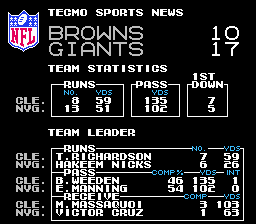 Although overestimating Trent's YPC, the final numbers are within the Tecmo Margin of Error. TSB also predicted around 100 all purpose yards; Trent finished with 128. The numbers, when graded on their respective curves, match up nicely. 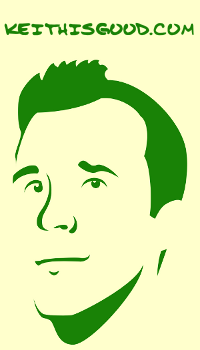 The real mind-blower is that TSB Predicted Weeden would throw a drive-negating pick in the endzone early in the fourth. Weeden actually did throw a drive-negating pick in the endzone early in the fourth. To quote Joey Lawrence, "whoa!"